Why Do We Share This? Below we present a short analysis of our social media KPIs. We use social media as a B2B tool to share findings of our research work in the broader financial space. We also share other things we consider noteworthy. We are frequently asked, what we do on social media, why we do it and how we do it. Thus, we thought our findings, although neither scientific nor representative, might be interesting to a broader audience. Below we present, how social media develops for us. It might be completely different for other companies, people, industries, themes. Therefore, we would love to hear about your experience. We are predominantly using twitter and LinkedIN, but also the German network Xing. We track follower/contact growth for these three. We also experiment with a number of addtional networks. Below we analyse weekly follower growth numbers for twitter and LinkedIN only. twitter works just great for us. We share one to three genuine tweets a day and experience strong user growth of 1.9% wow for the last 48 weeks. We currently have 7.570 followers on twitter. LinkedIN growth is lower for us. This is both for wow changes but, of course, also for absolute numbers. We currently have 1.650 contacts/followers on Linkedin growing with an average of 1.2%. 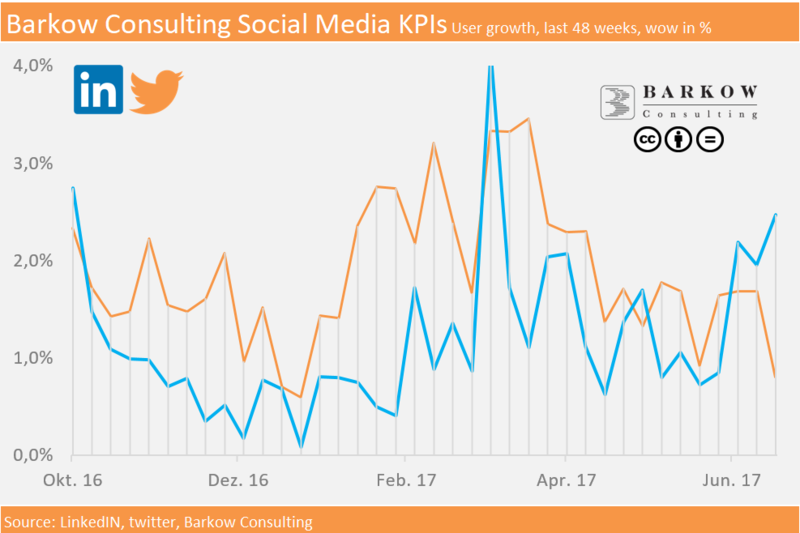 Surprisingly, LinkedIN has outpaced twittter on wow growth in % during the last three weeks. Absolute follower/contact growth is much lower on LinkedIN compared to twitter. As this has never happened before, we wonder whether this is the start of a new trend? Is LinkedIN continuing to outgrow twitter? We sense that twitter growth on sunny days is much lower. So maybe, growth trends reverse, when days get shorter, rainier and colder. WoW growth is very volatile on both platforms. Volatity (measured in coefficient of varation) on LinkedIN is 2x as high as on twitter. So maybe, three data points is not enough to establish a trend in this case. We have not changed our strategy on the two networks, at least not deliberately. We would love to hear about your thoughts and experience!